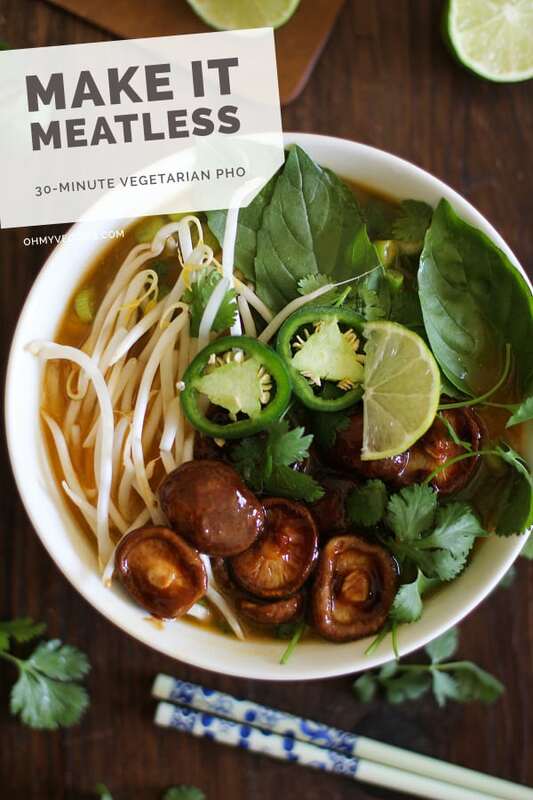 30-Minute Vegetarian Pho Recipe from Oh My Veggies! The first time I went out to eat at a Vietnamese restaurant with my family, I was very unsure of what to expect. I had the misconception that the meal would be your run-of-the mill greasy, heavy food, requiring a great deal of extra sweat time at the gym. I was surprised and delighted when I ordered pho soup and was presented with the largest bowl of fresh and flavorful ingredients I had ever happened upon in public. For those of you who are unfamiliar, pho (pronounced ‘fuh’) soup is a classic Vietnamese dish. A typical pho includes rice noodles in broth, a combination of raw and sautéed vegetables, fresh herbs, and rare sliced steak. Since we’re making this meal meatless, we left out the steak and added in meaty sautéed shiitake mushrooms. I sautéed the shiitakes in butter and hoisin sauce, but you can easily switch out the hoisin for soy sauce or liquid aminos. The broth for a traditional pho usually involves a whole lot of spices and a whole lot of simmering–sometimes for up to 3 hours if you’re making the stock yourself! I wanted to make a pho that was doable for a weeknight meal, so I simplified things by making a quick ginger broth instead. I usually serve my pho with store-bought hoisin sauce and chili garlic sauce so that people can mix and match sweet and spicy flavors as desired. You can easily add your favorite vegetables to this 30-Minute Vegetarian Pho too. Since it is spring time, you can throw in asparagus, snow peas, fennel, or sliced radishes; for summer, try thinly sliced zucchini or yellow squash or green beans. Tofu, seitan, or cooked slices of tempeh can be added to up the protein in this recipe too. Pho is highly customizable, so everyone can assemble their own bowls with their favorite add-ins. Who doesn’t love that kind of dinner?! 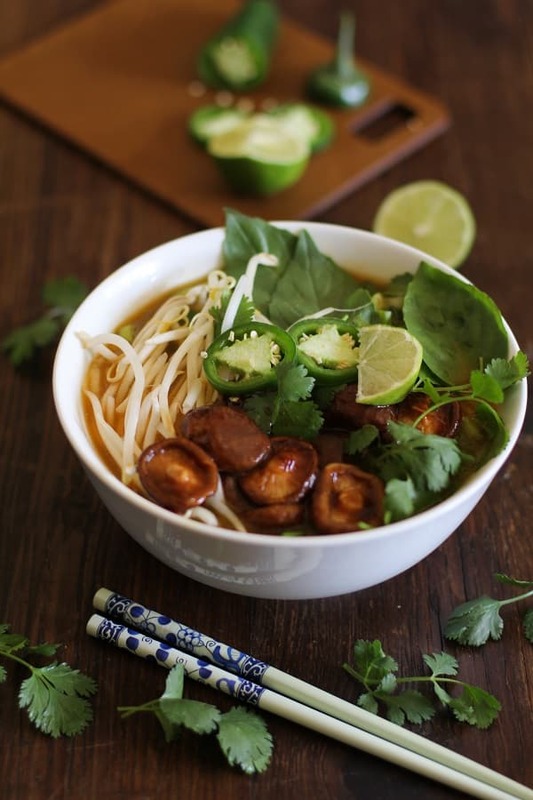 A streamlined version of pho with a simple ginger broth base and shiitake mushrooms to make it meatless! In a large pot, combine the vegetable broth, green onion, grated ginger, and salt. Bring to a full boil, then reduce the heat and simmer for 15 minutes. While the broth is cooking, melt the butter in a large skillet over medium heat. Add the mushrooms and sauté for about 6 minutes, or until tender, stirring frequently. Stir in the hoisin and sesame oil and cook until the sauce thickens and coats the mushrooms, about 1 minute more. Remove from heat. Divide the rice noodles between four to six large bowls, then fill each bowl with the ginger broth. Add bean sprouts, sliced jalapeños, shiitake mushrooms, fresh basil, and cilantro and serve with lime wedges, hoisin, and chili garlic sauce. 20 Protein-Packed Meatless Dinners Oh My Veggies Is Hiring! This recipe is sooo simple & delicious! I’m making it again for the family next week. Where is the recipe for the broth? I assume this recipe calls for store-bought vegetable broth. You know, broth in the carton? What would be a good winter vegetable to add? I have some extra butternut squash, but not sure if it is suitable for this recipe… Thinking of adding some broccoli now. Would broccoli or edamame work as a vegg in this recipe ( or other winter veggie?)? I have some butternut squash, but I’m thinkin’ that may not work. I have had vegetarian pho with broccoli florets in–just tonight actually–and it was delicious! It also had big chunks of baby bok choy, carrot slices, and mushrooms in it, and it was SO good! I’ve only had pho that I’ve made myself at home (hardly authentic), but now I might try to replicate the recipe I had tonight. This dish, pho, is fantastic! My only replacement was ‘not beef’ broth instead of vegetable. I will definitely make it again. I love these bowls! May I ask where you got them from? This was super good and I’ll be making it again; or at lease the broth to serve with wonton. But I feel that you should specify in the recipe to use Thai basil, not sweet basil (‘regular’). Very tasty! I substituted pea sprouts for bean sprouts and added some wheat sprouts. I like how this is very quick and does not require hours for the broth. Had our first bowl of pho a few weeks ago in a lovely Vietnamese restaurant in Manchester and absolutely loved it, so we decided to try and make our own. We found this recipe and added out own tweaks to it. This pho beats the pho we had at the restaurant. Absolutely delicious and so straight forward. I know this post is old, but it seems silly to include butter because simply using olive oil makes this recipe healthier and vegan, and it won’t alter the taste drastically. I agree; I am Vietnamese and this almost made me cringe when I saw the ingredients. I appreciate the thought it in making it quick and easy for a weeknight meal, but what makes it “pho” are the five spices (anise, cinnamon, cloves, cardamon, and coriander seeds). You can easily find these spices at an Asian supermarket (there are options where all the spices for pho are conveniently in one package/mesh bag that you can simply throw into the broth) and it does not require any more time allotted in this recipe. I am glad everyone who tried this recipe loved it, but if you want it a bit more authentic the spices are a must. Would pre-mixed five spice do the trick or are the ratios off to be good in pho? I have a jar already but might mix my own if its horrible like pre-mixed “curry” powders. When you brought up “cultural apropriation” my eyes rolled so far to the back of my head that I nearly choked on them. Needless to bring up the fact that pho, the cuisine itself, had its origins in French and Chinese cooking, but never mind that fact. “Cultural appropriation” is somethin mg only evil imperialist whites do, and is not at all something that has been going since the written word and human culture took form, and it’s actually HOW culture itself takes shape. You’re all a bunch of shitlords, go retake your ethnics courses. Oh boy, “cultural appropriation”, one of my favorite buzzwords. If you want to throw out that card, you better go back to history, where pho itself was “culturally appropriated” from French and Chinese dishes. Or does that rule only apply to whites? Guess I should have listened to my ethnic studies teacher. Made this today with beef broth and it was so spot on it surprised me! Used a lot of mung beans in place of noodles and it was a delicious low carb pho! I’ll def. be making this again! Please note that the prep time for this recipe is longer than 30 minutes, as the prep time needed for the rice noodles is not accounted for in the recipe. This sounds super simple and delicious! Pho is awesome! I don’t use butter in any recipes but don’t really tend to replace it… would it work without? or could I just use a tiny bit of coconut oil or…? I wanted a nice warm and tasty dish for autumn nights this week and have found a winner in this recipe. I didn’t have sesame oil (booo) but I used veg oil and added sesame seeds to it to coat the mushies! I made this for dinner tonight and OMG it was delicious! Easy to prepare and I switched out the butter for olive oil to make it vegan, definitely going to be making this a lot! Was looking for vegan recipes when I stumbled across this. Looks really good, and will work for me if I skip the butter. One note: most traditional pho broth bases are overnight works, not just 3 hours. The complexity of said broths are the pride of whomever makes it. Kinda like spaghetti sauce in Italy: the basics are pretty standard, but the nuance is determined by the family recipes. Looking forward to enjoying your fresh and quick take on this yummy standard.